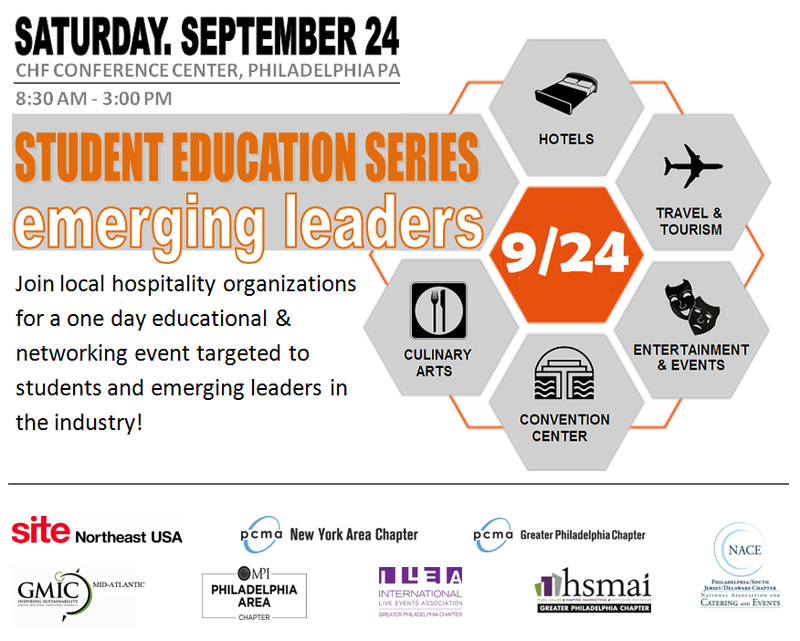 Join SITE, NACE, HSMAI, PCMA, ILEA, MPI & GMIC for a legendary Emerging Leaders Student Education and Networking event in Philadelphia on Saturday, September 24th. This one-day event will ensure college students network and engage with industry peers and leaders, as well as explore the many exciting career paths available within the hospitality sector. Kicking off with keynote speaker Michael Lyons on "The Brand of You", association networking time, and speakers panel luncheon, there will also be educational breakout sessions available by specific interest and topic. The excitement then continues with cityHUNT’s action-packed Scavenger Hunt, as we hunt the streets of Philadelphia in teams to solve tasks via smart phone, finally closing with a multi-media/awards reception. Registration includes full day of educational events and includes breakfast, lunch and Scavenger Hunt. Scholarship opportunities will also be provided. *Student Registration is only $20.00 and includes breakfast, lunch, all education sessions and Scavenger Hunt activity! Please join our Event Mailing List below to be the first notified of event updates! Michael Lyons is a Professional Speaker, Actor, Consultant and highly respected veteran of the meetings/travel industry. Prior to going out on his own in 2014, he served as Exhibition Director for MICE trade show IBTM America, organized by Reed Exhibitions. Mike’s diverse background, spanning 40+ years, includes senior level posts with iconic industry companies like Carlson Wagonlit Travel, and he was also the co-founder and CEO of GEP Philly, a leading DMC in Philadelphia. Throughout his career, Lyons has been active in numerous hospitality industry organizations and served on the Board of the Philadelphia CVB for 8 years. During that time he was also on the Advisory Board of Visit Philadelphia and served two terms on the Philly MPI board. As a professional actor, he has numerous credits in films, TV shows, and commercials including speaking parts in “The Sixth Sense”, “All My Children”, “Veep”, “What Would You Do”, and “House of Cards”, among others. As a speaker, he has given talks to numerous groups in the U.S. and abroad on a variety of subjects with a focus on how to enhance your Personal Brand and pursue your passion. Gil has over 30 years’ experience in the hospitality industry, working in various positions with Omni, Marriott and Hyatt Hotels. He also has extensive off premise catering and convention center experience with the Kansas City Convention Center and Pennsylvania Convention Centers. He is a five time Director of Catering Sales and Convention Services and was Vice President and General Manager of ProAct Events Group and Kansas City Scenery. 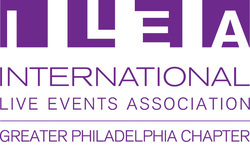 He is a past national board member and Vice President of the National Association for Catering and Events (NACE) and a current board member with the Philadelphia/South Jersey/ Delaware Chapter of NACE. He is also a member of ICA and MPI and a past board member of the Kansas City Chapter of MPI. Gil is actively engaged as a presenter, guest speaker, moderator and industry panelist for multiple MPI, NACE, SGMP and NBTA programs and educational conferences. He currently heads GT & H Hospitality Consults, assisting a variety of hospitality based companies in achieving their goals through aggressive marketing strategies, profit improvement, customer service and product expansion. Don started his first business at age 14 picking apples, pressing cider and selling it out in front of the local Save-a-Cent store in Hockessin, Delaware…many, many years ago! As a serial entrepreneur he has built and sold 6 business from printing to hot sauce, board games to used computers. One common fact among all business models was the need to market whether to industry or consumers. He has exhibited at over 100 trade shows in multiple industries, won over 30 industry awards, spoken at dozens of events and raised capital from angles and groups of investors along the way while growing businesses. His knowledge of pre-show, demonstration/operation and post show follow up have helped many companies generate not just leads but sales from the trade show floor. He is a graduate of West Virginia University with Sales Training and experience from the Southwestern Book company of Nashville, Tennessee. Phyllis possesses over 30 years of industry expertise. Many call her the ‘Queen Bee’ or ‘Top Mum’, whichever way they call her she is recognized by clients and industry professionals as solver of all problems. With her warm and welcoming personality, she has the ability to make everyone feel at ease. Being the eldest of 7 and a mother of 3, she is a giver and caretaker by natural spirit and is constantly radiating her philanthropic characteristics through her personal and professional life. She is noted for being well informed and well connected. Her get-it-done attitude has her always on the go preserving and building relationships and facilitating the impossible or incomprehensible into a reality. She enjoys bringing families together to celebrate momentous occasions and specializes in creating new and unique experiences. In 2002, she became a Certified Special Events Professional (CSEP), a designation achieved through education, performance, experience and service to the special events industry that reflects a commitment to professional conduct and ethics. Phyllis is extensively involved within the special events industry sitting on just about every board and receiving countless awards for leadership, professional expertise and design skills. She is also a dynamic leader in the business community and tireless in cause-driven community service. She is the co-chair of the Abington Education Foundation and is involved in many local non-profit organizations. In 2011, Phyllis was awarded Smart CEO Magazine’s Brava! Award, as a local female entrepreneur demonstrating excellent leadership in the business world and community. This recognition depicts her constant philanthropic efforts in her community and recognizes her as a leading mentor for females in business. She is an asset to her corporate and non-profit clients due to her ability to see the full picture and recognize opportunities for success within all parties involved. She carefully examines every situation understanding each stakeholder’s values and goals to create a successful and productive outcome for all. No matter which role or industry she is serving, Phyllis is always there to lend a helping hand and to position everyone in the right direction for optimal success. Sara McWilliams joined HelmsBriscoe in 2005 to assist her clients by customizing solutions for their meeting needs. Sara's goal is to exceed her client's needs by going above and beyond their expectations. She will be responsible for hotel site selection, contract negotiations, client and hotel relations. Resides outside Philadelphia in Berlin, New Jersey who is an active member of Greater Philadelphia PCMA and serves on Membership Chair. When Sara isn’t traveling or working she volunteers at her children’s school and church. Or you may see her out with her husband who is a veterinarian walking their 2 golden retrievers. A graduate of Iowa State University's Hotel and Restaurant Management program, Sara continued her studies at Switzerland's International College of Hospitality which introduced Sara to the fundamentals of the hospitality industry. For it was Sara's 12 combined years with Marriott International, ARAMARK Conference Centers and an independent hotel, that developed her exceptional customer service skills. She has worked at various locations from Des Moines, Phoenix, Chicago, Washington DC, Philadelphia and New York City. This has enabled Sara to be very resourceful in assisting her client's needs as well as those in the industry. My motto that I learned from my father and live by today is….work hard, play hard. The Differences working for a Hotel, Convention Center and Off Premise catering operations. Which is best for you? Outside Sales Calls. Why most Sales Managers Fear this important function and how to succeed! Can social media help or hurt you?